The Doctor (Matt Smith) and Amy (Karen Gillan) ponder the mystery of the cubes. This week's Doctor Who made such an impression on us both that we felt the need to share our separate thoughts for 'Power of Three'. 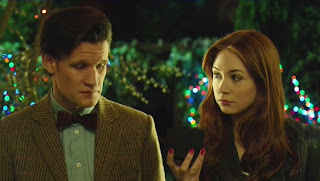 Check our reviews out and tell us what you thought about the episode, series 7 as a whole so far, or what you think might be the ending for the Amy and Rory in next week's episode. 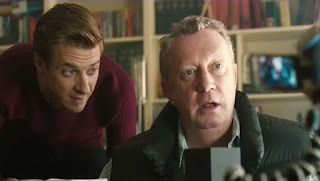 Rory (Arthur Darvill) gets caught in his pants by agents of UNIT. It's also prime fan-service. With the ‘Power of Three’, writer Chris Chibnall has given us a quasi-invasion story similar to the many full-on breaches of Earth that we’ve seen from the likes of Russell T. Davies. There was a decent Unit presence, more call-backs to previous recent companions and Time Lord mythology than the past couple of series have contained, and we’re also getting that much closer to the end of Amy and Rory’s adventures through time and space. It shows in this episode in the best of ways as we get to see the Doctor grow truly nostalgic already for his current recurring companions—almost like he may even know what’s about to happen to them. That’s up for debate certainly, but it’s hard to count out the possibility entirely when there’s the very phone charger of Rory’s that was mentioned in an earlier episode. 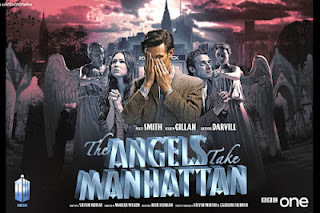 Things seem especially timey-wimey for the Doctor this series and perhaps we’ll get some light shed on that next week in ‘The Angels Take Manhattan’. The Williams men: Rory and Brian. It was refreshing to see the Doctor stick around in present-day Earth for a while and it provided some of the best humor in the episode. 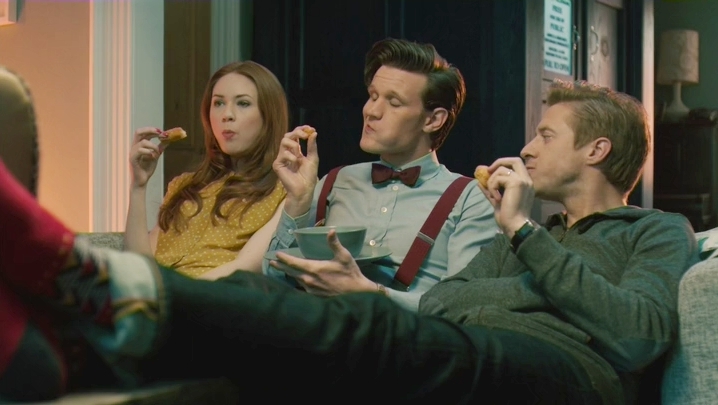 Watching the Doctor play on the Wii, anxiously do yard-work when bored, or even simply sit around with the Ponds in the lounge all brought a down to earth (literally) quality to the episode. There was a feeling of true camaraderie in how much it’s evident that the Doctor cares about Amy and Rory when he shows up for their wedding anniversary, for example, in order to whisk them off onto another grand adventure. Of course, it was one where things went badly fairly quickly after which so completely represents all of the Doctor’s good intentions in a single sequence. 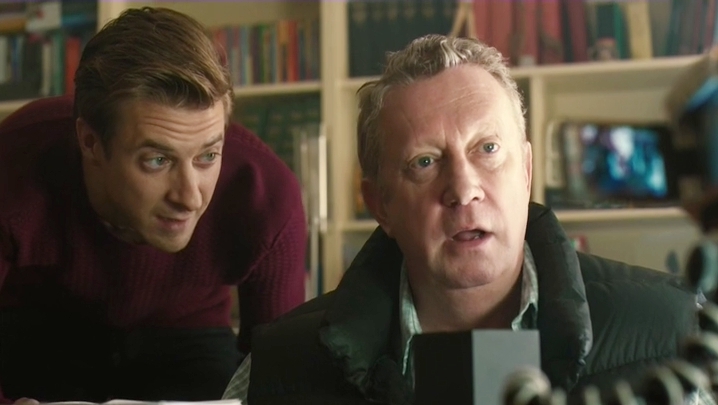 One highlight of seeing the Doctor’s obvious attachment to the Ponds was found in an excellent scene between himself and Rory’s dad, Brian Williams. A character that has definitely found a place in the pantheon of great ‘companion support’ be they friends or parents. When the actual nefarious plot of the episode was revealed things went a little into the too-safe category especially with how easily everything was fixed. It’s always astounded me that people in the fandom put Moffat on the creators who love to kill list when so many of the Who episodes he’s overseen are filled with such hope by the end. The setup does get brownie points (Jammy Dodger points?) for integrating the portal onto the orbiting alien ship into Rory’s actual workplace at the local hospital—talk about Doctor life and real life combining there. There was also great amusement in the fact that the threat was perpetrated by sleek cubes that easily could have come out of a Sky Mall catalogue--they served no real function and yet people around the world eagerly amassed collections of them in their homes and offices. In the wake of the iPhone 5 mania this past week it’s not hard to believe that actually could happen. The gang having a snack. It's really making me want to try fish fingers and custard. To reference the name of the episode, as Amy did herself and if you’ll notice they’ve just about name-checkedevery one of the titles for this series in the show itself, the power of three here meant that everyone was on thetop of their game with their performances. Smith especially is just really doing some great things in his role thisyear that make it feel like maybe it’s taken this long for him to be fully comfortable in his own bow-tie and tweed—enough that we can really see the subtleties in his performance, the range of emotions on display. 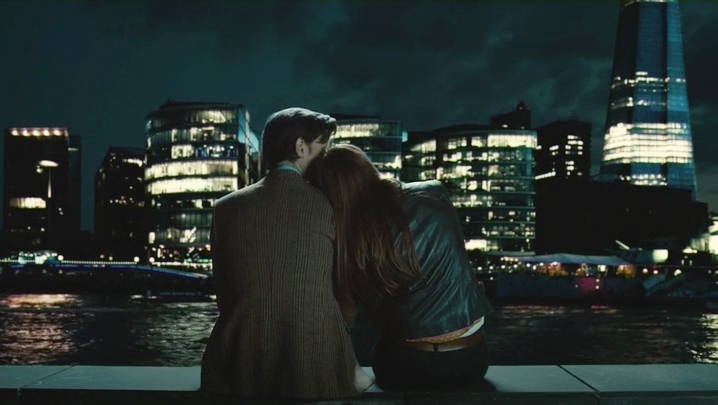 A quiet moment of reflection with the Doctor and Amy. Ever since I learned that this episode would be a good old ‘invasion of earth’ story I was excited. The Eleventh Doctor hasn’t had a story like this yet, while Nine and Ten both had numerous adventures saving the modern-day planet from various foes. Perhaps there’s a reason for that, but maybe it’s because the Doctor has been running. Running from the sorrow and the guilt of his previous incarnations and the choices he’s had to make, families he’s torn apart and companions he’s left behind. All these issues come up again when Brian Williams asks what’s happened to the others who’s traveled with him. Which forces the Doctor to painfully admit that some of his past companions died along the way, but he vows it won’t be the Ponds, never them. 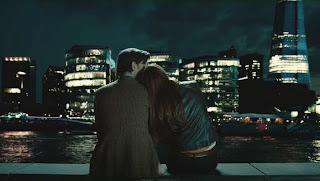 And in perhaps another moment of foreshadowing in this episode, the Doctor explains to Amy why he can’t just sit still and watch the boxes because there’s so much out there to see. As well as how he can’t just leave Amy and Rory behind--even if it’s what’s best for them, and that he’s running to Amy and Rory before they fade from him. Compared to all the other companions in the new series of Doctor Who, Amy and Rory have been separated the most from their rightful time and their families. Hell, Rory’s dad has only just been brought into the fold a few episode prior. So getting to see more of their home life and watch them try to decide if they should just stop going with the Doctor on these wacky adventures, which with Eleven’s breakneck speed who can blame them, so they can just have a normal life. Amy has even estimated that she and Rory are ten years older now than the rest of their friends just from traveling around with him so frequently, and it’s easy to see how that can be when a one night’s stay at the Savoy Hotel turns into a seven week adventure. 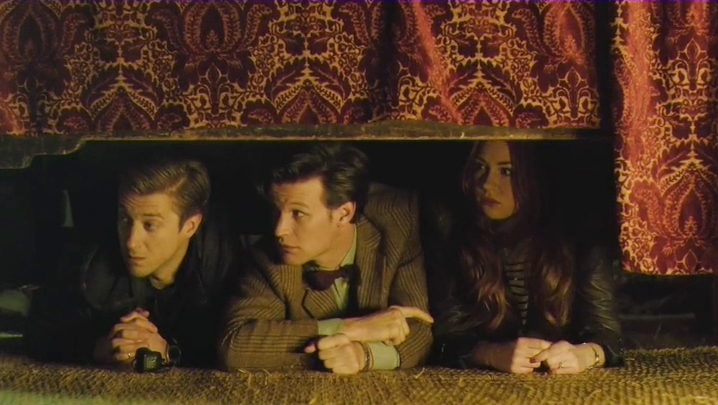 Rory, the Doctor, and Amy hiding from King Henry VIII. I also can’t help but wonder where in canon this story takes place, because in the prior episode the Doctor mentioned that Rory left his phone charger in King Henry VIII’s suite. A seemingly cute remark yes, but now in this episode we saw him do it, (and if you didn’t catch it watch again closely). This opens a few possibilities, since this episode takes place both before and after ‘A Town Called Mercy’. Perhaps those seven weeks of lost time during the anniversary party included a pit stop to the town. Another possibility is the Doctor himself is out of order, perhaps for the entire season, as again in this episode you can only wonder if he already knows of Amy and Rory’s ultimate fate. Will they survive? Will someone get lost in time? Tune in next week and find out! The time we've been dreading has arrived as Amy and Rory's final chapter with the Doctor is unveiled. We've got Weeping Angels, an old friend coming back to say, 'hello sweetie' plus another episode of Doctor Who this series set in America. You'll likely never look at the Statue of Liberty the same way again.